Early in literacy learning children must discover something about the arbitrary conventions we have for putting the language we speak into printed form. The road to reading and writing is marked by print encounters in which youngsters discover the connections between oral and written language. Developing concepts about print in children at an early age is invaluable to their literacy development. Read more about concepts of print! Young students need to learn important concepts of print like book handling skills, text directionality, spacing, function of letters and punctuation. They also need to understand that print can be used to communicate information. 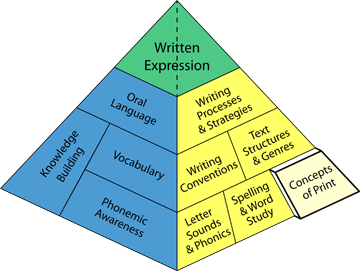 This knowledge, which is most important in the early grades, provides an essential foundation for the development of reading and writing skills. Teachers can support the development of concepts of print by explicitly showing students the features of written language. This might include information about the nature of books, text organization, and the purpose of letters and words. Teachers can use many activities to teach print concepts, such as pointing out key features of books while reading aloud, or modeling writing a morning message. Teachers can assess concepts of print informally by giving a student a book and observing him or her. For example, how do they hold the book? Can they point out features like the cover page and title, a word, a period, and a space? Do they know where to begin and in which direction to read? These behaviors indicate a developing understanding of concepts of print. Monitor progress throughout the year. How to Use a Morning Message: Building Concepts of Print and Much More!